I'm recording this episode on the road this week, delivering a keynote on leadership at a Project Management Institute Professional Development Day. Since I have leadership on the brain today, let me ask you: Think of one of the best leaders you've ever had the privilege of working with.... What was it about that person that made them such an effective leader? Though the details of your answer could be different from what others might say, chances are we would all agree that the best leader that came to mind for us shared one thing in common: credibility. 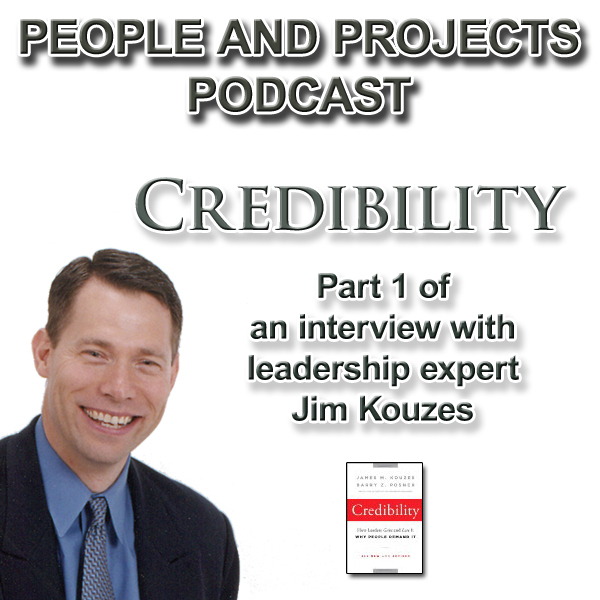 Credibility is fundamental to being a leader, and in this cast I'm excited to share the first of two episodes from a conversation with Jim Kouzes. Jim, along with his co-author Barry Posner, are some of the foremost researchers and voices on leadership, including works such as their best-selling book The Leadership Challenge. In these next two episodes, I talk with Jim about their newly updated book Credibility: How Leaders Gain and Lose It, Why People Demand It. Don't miss the next cast where Jim and I talk about what to do when you're given an assignment that's over your head. How does that impact credibility? And what about when you have to execute against a decision you don't agree with? Does that mean your credibility is on the line? Jim shares his expert coaching with those questions and more so don't miss it! You can learn more about Jim Kouzes and Barry Posner online at http://www.leadershipchallenge.com/.